Terrestrial Ecosystems and Global Change program (TECO) through DoE. National Science Foundation via the National Center for Atmospheric Research's Atmospheric Technology Division. 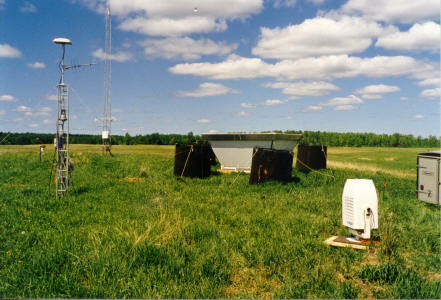 Radar/RASS measurements of boundary-layer developement will be conducted at two long-term flux tower sites, WLEF in Wisconsin, and Walker Branch in Oak Ridge. The goals are to observe the hypothesized rectifier effect which suggests that boundary-layer CO2 is enhanced over land compared to tropospheric values. If true, this effect has caused significant misinterpretation of the global CO2 distribution. A basic product will be seasonal-scale observations of the diurnal evolution of boundary layer development at each site. The combination of direct, continuous flux divergence measurements at WLEF with continuous boundary layer depth monitoring provides a unique opportunity to study entrainment processes and plant-soil-cloud-ABL coupling. We will study the coupling between ABL development and net ecosystem exchange (NEE) of CO2. The plant-soil-atmosphere system is dynamically coupled, and these interactions must be observed to understand NEE of CO2. Boundary-layer growth and entrainment are often neglected in this system, but are critical to describing the couple land-atmosphere system. We will work at the WLEF tall-tower (March through October, 1998 and 1999), where flux divergence is observed directly, then attempt a similar study at Walker Branch (February through November, 1999), in an effort to extrapolate these methods to a small tower site, and see if this temperate ecosystem is substantially different from the WLEF region boreal forest. One dimensional coupled land-atmosphere models will complement the observational analyses. The 1998 and 1999 radar/RASS deployments are supported by the National Center for Atmospheric Research's Atmospheric Technology Division.